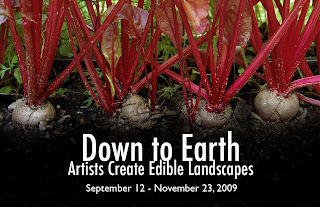 UPDATE for Down to Earth: Artists Create Edible Landscapes opening September 12th. Artists: Joan Bankemper, Knox Cummin, Ann Rosenthal/Steffi Domike, Stacy Levy, Habitat for Artists (with Simon Draper, Jeff Baily, E Odin Cathcart, Cathy Lebovitz, Todd Sargood) and Susan Leibovitz Steinman. For more background on the exhibition please scroll down the blog page to the May 28th post for project descriptions. Also, click on images below to make them larger. 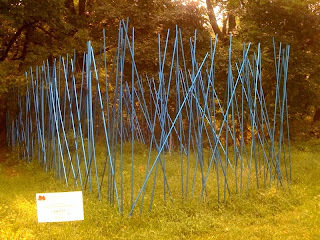 Three weeks since my last visit to see the progress of the artists' gardens in Philadelphia at the Schuylkill Center and the new growth was lush and overflowing. Philly has a warmer and more humid climate than where I live in the Hudson Valley, and I was shocked to see the rapid growth in comparison to my home garden that has produced very little in the way of veggies with the exception of cucumbers and lettuce (plants that don't mind wet and cold conditions). My tomato plants got early blight, but the red & yellow heirlooms planted in the American Roots Garden by Ann Rosenthal and Steffi Domike were healthy and delicious if not a bit overgrown! The rain barrel water collection system by Knox Cummin has done a great job, but on this visit the barrels seemed to be clogged and we had to resort to the hose off of the farmhouse. Ann did a kids' camp workshop in July at SCEE to create a series of art banners depicting the various plants that came out beautifully and are now hung on the tubing for the irrigation system above the garden. Water issues have been the biggest area of troubleshooting during the course of these projects and the artists have all had to be ingenious at working out ways for the gardens to be watered in their absence. Urban Defense by Susan Leibovitz Steinman is being watered from the house spigot, five hundred feet away with a soaker hose and timer system installed by Susan's assistants Fern Gookin and Scott Torr from Philadelphia University's Sustainable Design Grad program. Since Susan lives in Berkeley, CA, maintaining her garden has had its logistical challenges. However, Susan has a great team in place and with added gardening expertise and help by her close friend Fredda London, a Philly resident - things are looking great. Many of the plants in both of these gardens are ready to harvest and will go to local organizations that distribute fresh produce to the needy. Joan Bankemper's medicinal herb garden, Willa, was thriving and the soaker hose system she buried throughout her 7 chakra beds seemed to be in good working order. The tobacco plants in particular were enormous and had beautiful flowers, something I had never seen on these plants in fields that are not allowed to flower. In the photo to the left Joan is harvesting some flowering hyssop. There will be a complete list of all the herbs planted in each chakra and their medicinal benefits to those areas of the body available for the public at the opening. Simon Draper and Todd Sargood of HFA were working when I arrived mid afternoon in the hot, sticky August weather. They looked wilted but happy. Todd was adding some recent art tiles as siding to the shed. These tiles have been painted by kids, campers at SCEE and from local schools. They will continue to make more art tiles to be added before the opening day. The 7 garden beds around the shed were tended, weeded, and in some cases re-planted, as the earlier part of this summer was rainy and somewhat cooler than normal. Not great conditions for seeds to thrive. This project has been a real learning process for all with many successes and some frustration, but the results are already worth the effort. The artists have met with challenges during this "garden growing art project" that they probably have not encountered before, but took them on with dedication. They have had to depend on many volunteers and deal with the unpredictability of weather, animals, insects and soil conditions. Like gardeners they have been willing to experiment and to cope with these inherent risks and lack of control, all for a temporal public art viewing experience. Everyone will be back to finish up the first week of September in time for the opening day on the 12th. August 30th will be a volunteer day organized by Zoe Cohen and Rachel Dobkin, managers of the SCEE environmental art program. The gardens will be harvested, re-mulched, pruned and mowed around the edges to be ready for public viewing. 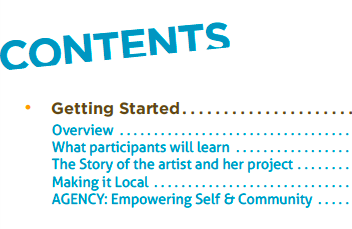 A gallery exhibition related to all of the projects will be installed indoors at the Center. Stay tuned for a report then.